Priests, police, and just about everybody in Manhattan called John Van Allen the Wickedest Man in New York, and he reveled in it. A born self-promoter, if Allen had been alive today he probably would have had a reality television series. Strangely enough, Allen and his criminal brothers Westley (Wess), Theodore (The. ), Martin and Jesse were the sons of a wealthy Presbyterian minister. 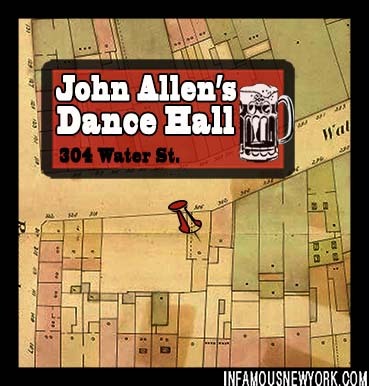 John amassed over 113 arrests for running disorderly houses across the city, but his most infamous den was a dancehall located at 304 Water Street. The Wickedest Man In New York holds court in his bar. 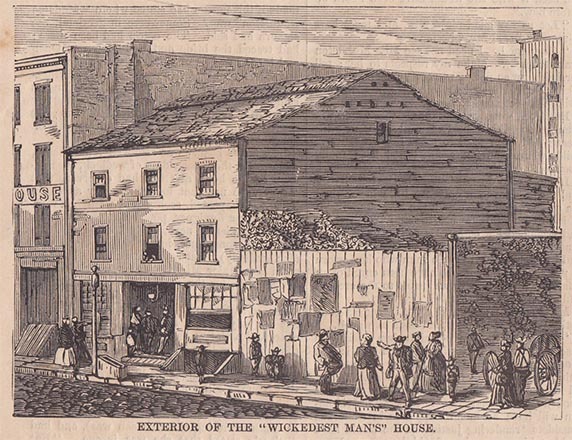 In reality, Allen probably wasn’t the wickedest man on Water Street by a long shot (the title rightly belonged to Tommy Hadden), but after his ceaseless campaigning for the title, the moniker stuck when the Allen transformed his whorehouse into New York City’s wackiest religious revival. 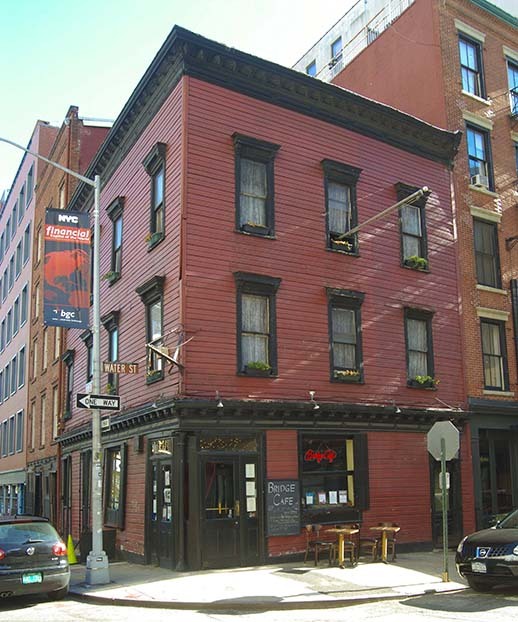 From Schermerhorn Row to the Thomas Carpenter house, the South Street Seaport boasts not only New York’s oldest buildings, but also one of its oldest drinking establishments, a pirate bar located at 279 Water Street, but now thanks to Hurricane Sandy, the Bridge Café may have to be shuttered for good. …a bagnio [brothel] filled with river pirates and Water Street hags. It was there that thieves and junkmen would meet to ‘put up jobs;’ it was there that men were drugged and robbed and women beaten…it was there that young thieves became graduates in crime. And it was there that folk legend Gallus Mag bludgeoned her way onto the scene. 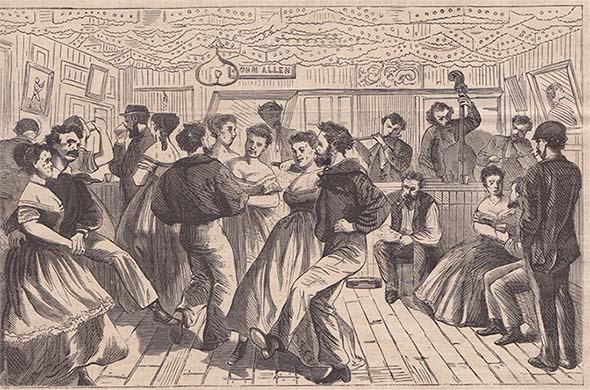 It is impossible to separate fact from fiction in the history of Mag, the noted six foot tall cockney bouncer, who kept a small sack filled with wet sand for knocking out sailors on her belt. 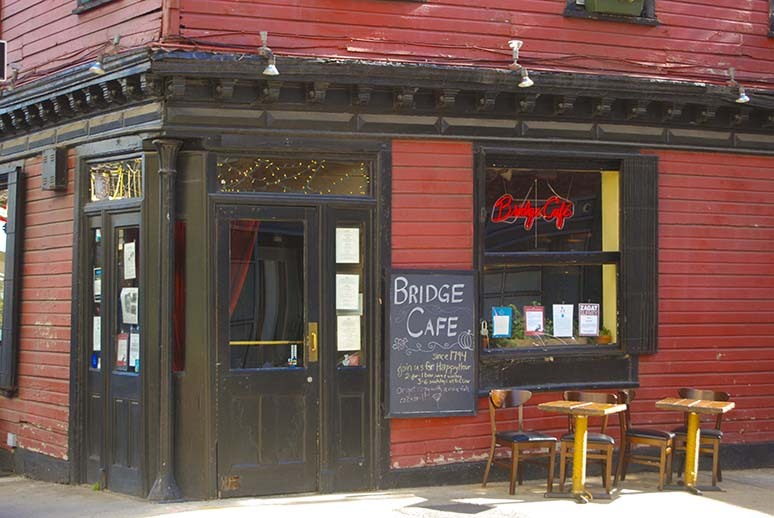 The Bridge Café is located 279 Water Street. Gallus’s real name was Mag Perry, but Water Streeters called her Gallus on account of the very un-lady like suspenders (galluses) she wore. Gallus ran the Hole In The Wall with her husband Jack, the distinguished thief whose greatest claim to fame, other beating a fourteen year prison sentence, was when he swiped Josh Ward’s championship rowing belt. The Bridge Café is New York City’s last standing pirate bar. Jack ran the front of the house, tending bar and robbing and drugging sailors, while Gallus worked clean up, biting off the ears and fingers of obstreperous bar flies. She kept those grisly trophies in a pickling jar on a shelf behind the bar that is still there today. 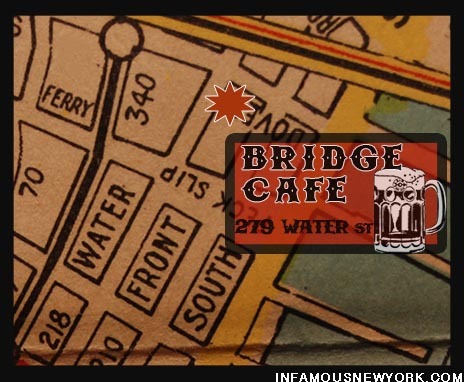 Around the 1880s the name of the bar was changed to the Bridge café, on account of the massive Brooklyn Bridge at the café’s doorstep. Before Hurricane Sandy the restaurant was akin to stepping back into the days of steam and sail, replete with an 1810 tin ceiling and an ancient mahogany bar. 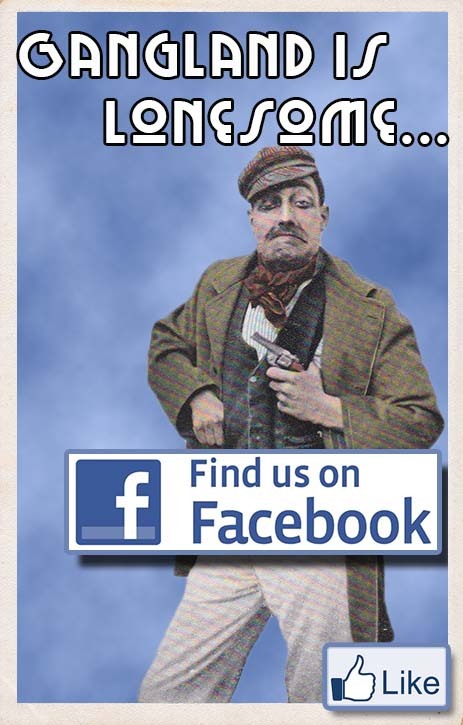 Now the Bridge Café needs help. During hurricane Sandy the dining room was filled with over three feet of water, but there’s good news, according to this New York 1 article the café plans to reopen in two months. So when they reopen, why not drop in at the Bridge Café, grab a soft-shelled crab sandwich and tell them Gallus Mag sent ya? If Michael Vick were alive in the 1860s he would have probably called Christopher “Kit” Keyburns’ Sporstman’s Hall home. A portly, jovial, pock-marked, sodden faced man, Kit operated a dog-fighting arena from this still-standing location. 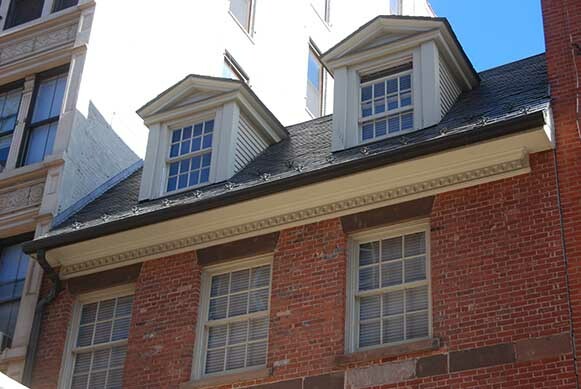 Now the third oldest building in Manhattan, this three story brick structure represented the heart of Water Street’s depravity. But today, the rat pit has gone the way of everything else in Manhattan—luxury housing. 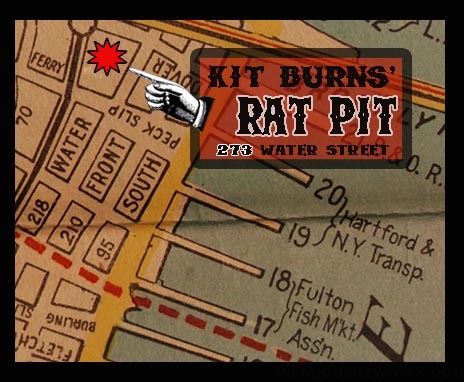 Kit Burns’ Sportsmen’s Hall was located at 273 Water Street. As a boy, Kit learned to work illegal prizefights under the tutelage of the bare knuckle boxing champ Yankee Sullivan. 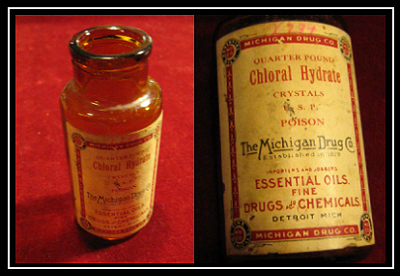 During one noted bout, Kit corned for fellow Water Streeter, Charley Lynch, during an eighty-six-round slugfest that ended in the death of Lynch’s opponent. 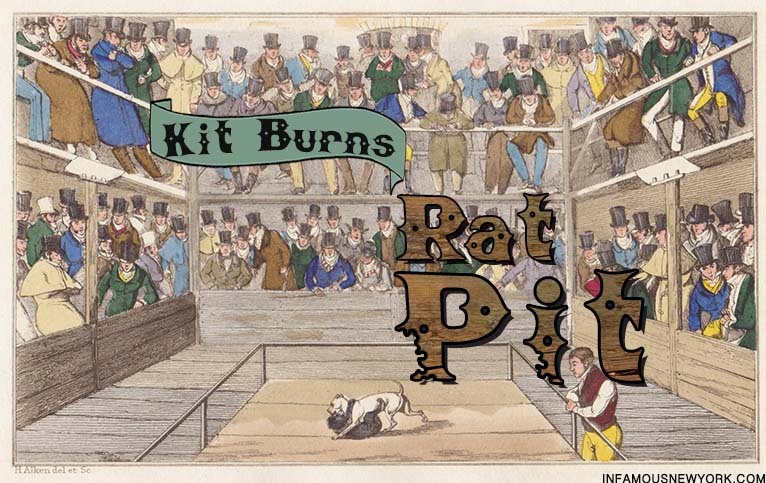 Prizefights made Kit’s reputation, but his real claim to fame was the Water Street Pit, a gas light illuminated octagon, eighteen inches high, sixteen feet long, and eight feet wide. The humanitarians spend another night at Kit Burns Sportsmen’s Hall. 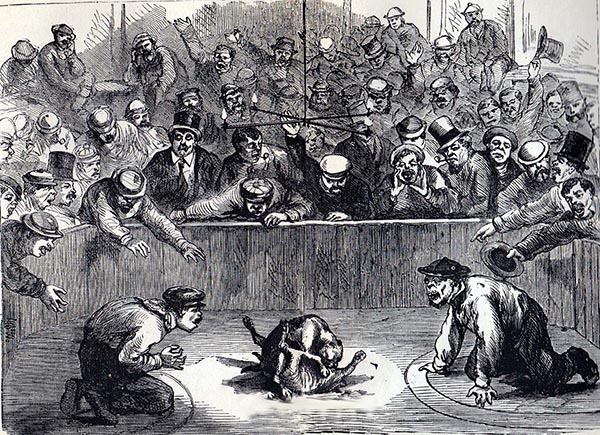 Rat baiting was one of the more popular games where sportsmen wagered on how many rats a terrier could slaughter. Jack, Kit’s prized 12 pound black and tan terrier, set a world record when he killed 100 rats in 5 minuets 40 seconds. After Jack died, Kit stuffed the champion pup and mounted him on the bar. Hung on walls and nailed to tables, Kit’s clientele could find the taxidermied champions of the past. Kit even owned a fighting black bear, which he pitted against challengers of any species. When not fighting, the bear had his own seat at the bar until he fell ill. Not wont to waste the skin, Kit skinned the fighter and turned him into a rug. Bears and rats were all fine and good, but the dandies really came for the dogfights. The rules were simple. Trainers matched dogs of the same weight to fight in officiated battle with a cadre of surgeons at the ready. If an animal did not make weight, the humanitarians at the pit lashed their dog to a treadmill in the basement and whipped their fighter until it sweated off the excess pounds. After weigh-ins, the coaches scrubbed their dogs with a scalding solution of water, soda, and castile soap. A taster then licked his dog from snout to paw to prevent the opposition from rubbing of their champion with numbing agents capable of weakening their opponent’s biting grip. …a fellow takes out a handkerchief and throws the stuff on the dog while he is fighting. A standing bet of $1000 held that Burn’s dog, Belcher, could best any canine on the planet. When Kit wasn’t fighting dogs and rats, he battled the police and the ASPCA. In one instance, the NYPD crashed through a skylight and arrested scores of patrons for disorderly behavior. 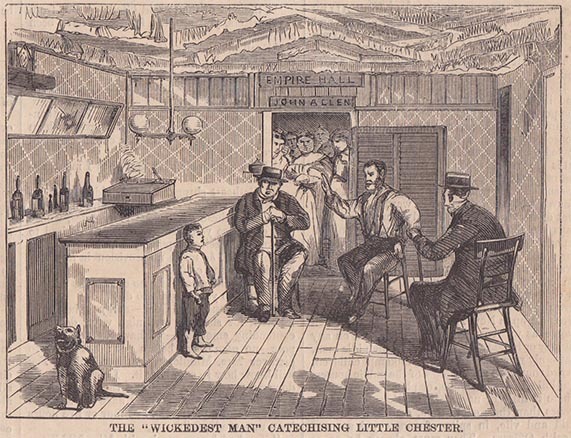 Kit eventually lost his grudge match with the ASPCA when the police arrested him for animal cruelty in November of 1870. The rat baiter caught diphtheria and died after beating the charges. He was 39 years old. This fourth floor was added to the Kit Burns’ building in the 1900s. Of all the Shanghaisters of Water Street, Tommy Hadden was the best. The barkeeps in the business of shanghaiing sailors called this salty little man with a wandering eye the Lime Juicer, because he could drug drinks with chloral hydrate as easily as squeezing a wedge of lime into a mug of grog. In his twenty-five-year-long career, the police figured that Hadden had kidnapped at least 1,000 sailors, but in addition to shanghaiing, Tommy excelled in both murder and evading the law. Like the time the Lime Juicer crushed a man’s skull with a slung shot in 1852 and walked away scot free. Hadden’s secret of how he stayed out prison was no secret at all. Although John Allen and Kit Burns often got the press, Tommy Hadden ran Water Street. Hadden’s Hotel at 374 Water Street existed as boarding house for sailors, which in the words of the New York Tribune, “…implies fleecing them; and in providing captains of ships with a man or two…” The club was little more than a filthy cellar strewn with a maze of lice infested beds that combined charm of a flop house with the stench of a saloon. 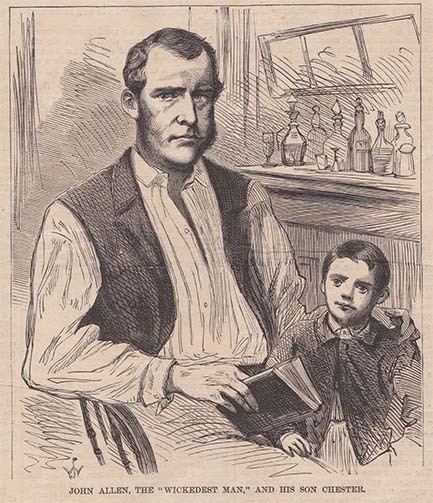 Hadden served two sentences for sailor-napping in New York, but the salty character overstepped his bounds in New Jersey in 1870 when the authorities sentenced him to ten years in state prison for an attempted shanghaiing. He was never heard from again.